Sardana, G.D., & Thatchenkery, T. (Eds.). (2015). Leveraging human factors for strategic change: An organizational culture perspective. New Delhi: Bloomsbury. Sardana, G.D., Thatchenkery, T. (Eds.). (2015). Understanding work experiences from multiple perspectives: New paradigms for organizational excellence. New Delhi: Bloomsbury. Thatchenkery, T. (2014). Appreciative Intelligence. Coghlan, David & Brydon-Miller, Mary (Eds.). Encyclopedia of Action Research. Thousand Oaks, CA: Sage. Sardana, G.D., Thatchenkery, Tojo. (Eds.). (2014). 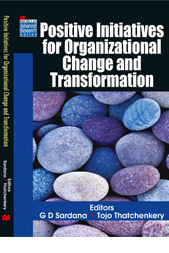 Organizational transformation: Change management perspectives. New Delhi: Bloomsbury. Sardana, G.D., Thatchenkery, Tojo. (Eds.). (2014). Strategic initiatives for competitive advantage in the knowledge society (2014). New Delhi: Bloomsbury. Sardana, G.D., Thatchenkery, T. (Eds.). (2013). Reframing human capital for organizational excellence. New Delhi: Bloomsbury. Sardana, G.D., Thatchenkery, T. (Eds.). (2013). Capability building for organizational transformation: Management cases from multiple disciplines. New Delhi: Bloomsbury. Sardana, G.D., Thatchenkery, T. (Eds.). (2012). Positive initiatives for organizational change and transformation. New Delhi. Macmillan. Sardana, G.D., Thatchenkery, T. (Eds.). (2012). 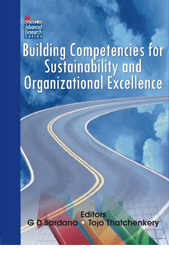 Building competencies for sustainability and organizational excellence. New Delhi. Macmillan. Thatchenkery, T., & Sugiyama, K. (2011). Making the invisible visible: Understanding leadership contributions of Asian minorities in the workplace. New York: Palgrave Macmillan. Thatchenkery, T., Cooperrider, D., & Avital, M. (Eds.). (2010). Positive design and appreciative construction: From sustainable development to sustainable value. Bingley, U.K: Emerald. Gupta, H.P., & Thatchenkery, T. (Eds.). (2010). Leveraging global competiveness for organizational excellence. New Delhi. Macmillan. Sardana, G.D., & Thatchenkery, Tojo (2009). Enhancing organizational performance through strategic initiatives: Handbook of management cases. New Delhi: Macmillan. Sahay, B.S., Thatchenkery, T., & Sardana, G.D. (Eds). (2008). Handbook on Management Cases. New Delhi: Allied Publishers. Thatchenkery, T. (2007). Postmodernity. In International Encyclopedia of Organizational Studies (Eds. Stewart Clegg & James Bailey). Thousand Oaks: Sage (pp.1283-1285). Thatchenkery, T., and Chaudhry, D. (2007). Appreciative inquiry and knowledge management: A social constructionist perspective. Cheltenham, U.K. Edward Elgar. Thatchenkery, T., & Stough, Roger (2005). 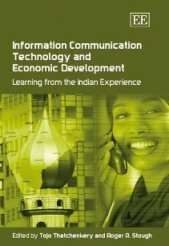 Information communication technology and economic development: Learning from the Indian experience. Cheltenham, U.K. Edward Elgar. Thatchenkery, T. (2005). Appreciative sharing of knowledge: Leveraging knowledge management for strategic change. Chagrin Falls, Ohio: Taos Institute Publishing. 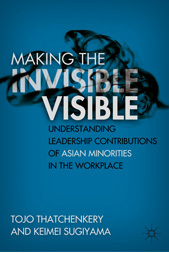 Making the Invisible Visible: Understanding Leadership Contributions of Asian Minorities in the Workplace (2011). New York: Palgrave Macmillan. By Tojo Thatchenkery &Keimei Sugiyama. 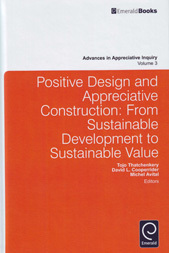 Positive Design and Appreciative Construction: From Sustainable Development to Sustainable Value (2010). Bingley, U.K: Emerald. By Tojo Thatchenkery, David Cooperrider, & Michel Avital. 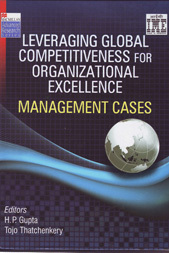 Leveraging Global Competiveness for Organizational Excellence (2010). New Delhi. Macmillan. By H.P. Gupta & Tojo Thatchenkery. 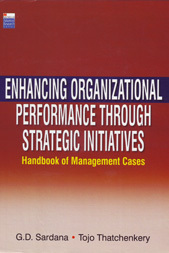 Enhancing Organizational Performance through Strategic Initiatives: Handbook of Management Cases (2009). New Delhi: Macmillan. By G.D. Sardana& Tojo Thatchenkery. 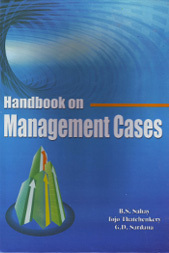 Handbook on Management Cases (2008). New Delhi: Allied Publishers. By B.S Sahay, Tojo Thatchenkery & G.D. Sardana. Inability to share knowledge has been widely cited as a contributor for organizational decline and stagnation. Even the U.S. Government appointed Commission that investigated the September 11, 2001 attack on the World Trade Canter and the Pentagon reported that the most identifiable cause was the failure to share knowledge among the intelligence agencies. Not surprisingly, therefore, organizations that have addressed knowledge sharing productively are often the best in their field. This book advances a unique approach called Appreciative Sharing of Knowledge (ASK) that will help organization create a culture that is facilitative for sharing what its key stakeholders know. The authors show that neither technology nor forced organizational interventions will create the right culture for knowledge sharing. Using the social constructionist approaches, historical data, and case studies from organizations, the authors demonstrate that appreciation or affirmation is the key ingredient for letting people trust each other and work through their inhibitions and concerns about sharing what they know. Click here to view an information sheet on this book. India has become a highly visible participant in the information communication technology (ICT) industry. Since the 1990s, it has been one of the fastest growing economies in the world, emerging as the most watched test of global capitalism. This book examines how the ICT-driven development of India appears to have skipped the middle stages of the traditional economic development models and leapfrogged directly to the final stage whereby growth is mostly technologically driven. India’s development pattern over the last two decades is distinctive when compared to other developing nations. A recent Goldman Sachs report stated that by the year 2050, India will become the third largest economy in the world, behind China and the United States. The report predicts that India's GDP will overtake that of Italy by 2015, France by 2020, Germany by 2025 and Japan by 2035. The books explores why India’s development is different and how India developed its ICT capabilities. 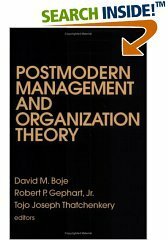 Postmodern Management and Organization Theory is the first book published (1996) connecting postmodernism and organization theory. The text gives an overview of issues as they relate to management and organization theory and its history and assembles in one volume a variety of important works on postmodern philosophy--including feminist, cultural, and environmental philosophies. The contributors address the future of postmodern advancement in management and organization theory and method, establishing an agenda for future research. Since 1996, this popular book has proven to be useful for scholars, researchers, students, and practitioners in organization theory and development.